When faced with a foundation problem, it can be overwhelming to look at all the possible solutions. You might be tempted to ignore all the confusing terms and attempt to solve the issue on your own, but in order to truly solve the problem, it is vital to contact an expert right away. They will present you with some solutions that can service your foundation repair needs and prevent any future damage. Professionals have a wide variety of foundation repair options. They offer anything from helical piers to plate anchors to stabilize your foundation and many in between. In order to understand the solutions, it is important to understand the problem. Foundation problems are caused by a multitude of factors, including bad drainage, ground movement, and faulty construction. When the temperature and moisture levels in the soil change, the ground under and around your home sinks and shifts. A sinking or settling foundation is a hazard to both your family and your home. Foundation issues can dramatically decrease the value of your home, and create a health hazard that threatens the safety of you and your family. When looking for signs of foundation trouble, keep an eye out for some common problems. 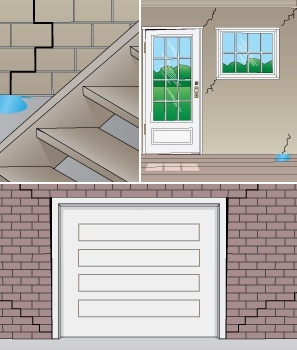 Usually, bowing, leaning, or cracked walls, a cracked foundation, a leaning chimney, slab cracks, garage cracks, or sticking windows and doors are signs that your foundation is settling. Luckily, foundation repair solutions are likely to completely resolve the problem and prevent any further damage. Helical piers, for example, are a common solution. They provide a quick, easy way to support your foundation and stabilize the area. Helical piers are easy to install and create little to no disturbance to the job site. When looking for a foundation solution for a new construction site or an old home, helical piers are always a great choice. Steel piers are more commonly used for problems caused by poor soil compaction and erosion. They provide an economical and permanent solution without having to rely on friction from the soil to support your home. These underpinning solutions are always tested during installation, so their safety is guaranteed. While helical and steel piers are used to support and stabilize the foundation, plate anchors are used to stabilize the walls. Cracked and bowing walls are stabilized during installation because plate anchors create enough supplemental lateral force to hold them in place. Again, plate anchors create little disturbance to the installation site and are an easy, economically-friendly foundation repair option. Other solutions, such as retaining wall tiebacks and basement tieback anchors, are also used to stabilize and strengthen the foundation. Many foundation repair solutions provide immediate and permanent repair to the installation site and will prevent future problems. Earth Contact Products provide the very best tools for foundation repair. This high-quality equipment is affordable and guaranteed to last. When looking to repair a settling foundation, contact a professional right away. Ignoring the problem or attempting to repair it yourself can create more damage and bigger problems for the future. An expert would be more than happy to come to assess your situation, give you an estimate, and provide you with the best solution. Let us help you find a specialist in your area!